I did it! 31 consecutive days of blogging. 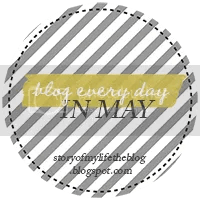 Today is the last day of the Blog Every Day In May Challenge. I can’t believe a whole month has passed not to mention, I wrote every day. I’m looking forward to a short break this weekend and then on to another “challenge”, the 4 week blogging e-course with Blogelina. I’m excited about taking Being A Wordsmith to the next level. When I was 17 weeks pregnant with The Deuce, I started a journal for him. I wanted to capture all the moments during my pregnancy, his birthdays, holidays, and milestones to come. I hope to have several journals to give him when he’s old enough to appreciate them. Here is an excerpt from one of the entries. Are you doing any blog challenges for June? Thanks Paula. And congratulations to you too. Congrats, you have been on it my dear! Such a sweet thing to do for Deuce! I need to write in that journal more. It's amazing the stuff you forget until you see it on paper. That's why it's important to write it when it happens. You are amazing! I don't think I could have written every day. Enjoy your weekend off! It was definitely a CHALLENGE. But I learned so much. Mostly about myself. Thanks Rachel. I enjoyed your “letting go” post about cleaning out your closet. Congrats to you too.